Hi guys, Good news! It is getting colder and I secretly hope that there will be actually some snow in Amsterdam in a couple of days. Well, though there is no snow yet, it's freezing outside. So I figured out to get my vintage fur out of my closet. I went to the Museumplein (Museum Square) together with blogger B50FashionWise. 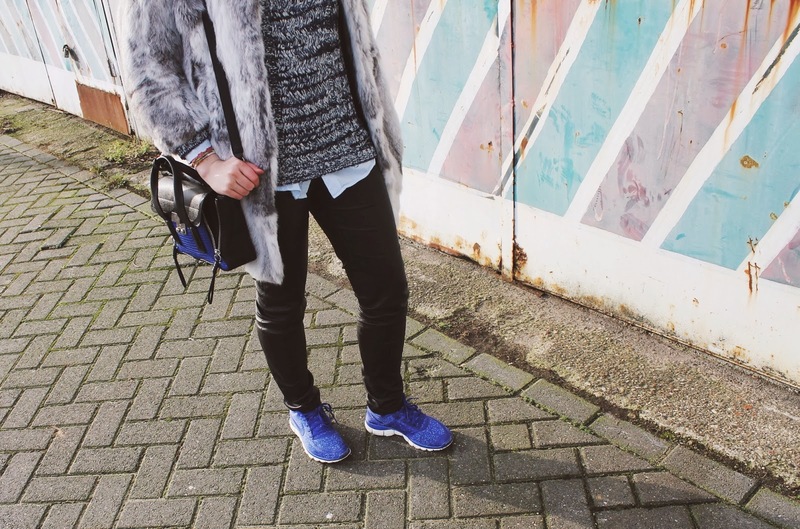 Brigitte started her blog this January and focusses on fashion for women above 50. How cool is that? And she is just like me a vintage freak and she's really creative too. She has her own accessory line, Keur Rouge, and re-use old pieces of clothing or accessories, to make cool bags, scarfs, bracelets or whatsoever out of it. Really cool! And the good thing is that I have a photographing partner in crime. I photograph her outfits and she does the same for me. If someone knows Amsterdam, it is her. So we get to the coolest places, like this skating place. These locations are my favorite (here and here). Which one is your fav? Let me know! 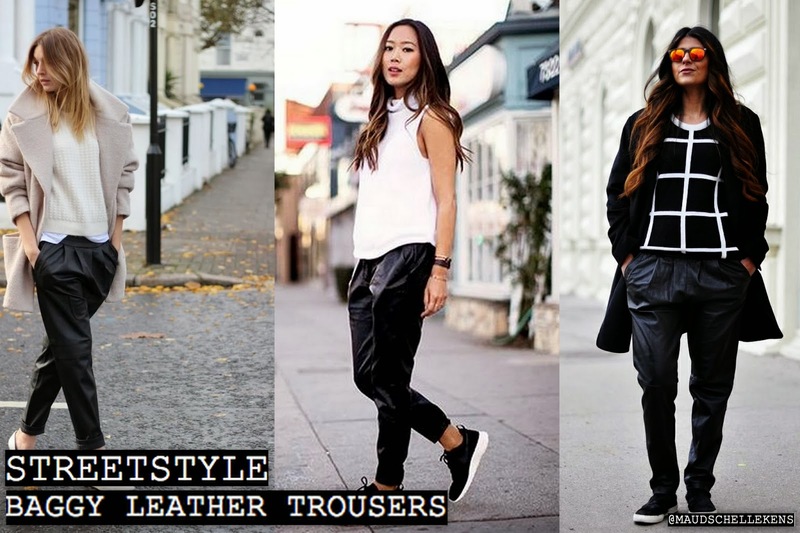 One of the new trends I adore is the baggy leather trousers. I am already years fond of the leather leg gin, which my followers know, due I wear it at least once per week. However, sometimes I even like a change. I saw one at Zara, so I think my credit card has to suffer a bit for that one. What do you think about this trend. Hot or not? Let me know! Hi fashionista's, Here is my second blogpost today about Mercedez-Benz Fashion Week Amsterdam, which I attended last Sunday. I won tickets for this show, thanks to Vodafone #First. It was the first official show of Ratna Ho where they official presented their first collection. The show was opened by the ladies of Bells of Youth by a great performance. When Bells of Youth stopped sining, they models started walking the runway. Remarkable was that there were loads of variation within the models. From skinny to bigger sizes, from young to a bit older, gave a cool twist to the show. We saw a lot of black combined with mint green, peach and lila piping and cords. This show was really spectacular, with Victoria Koblenko, actor and model Dirk Taat and fashion blogger Tess van Daelen front row. Hi fashionista's, Did you all enjoy your weekend? I had an amazing weekend including going out after my exams and meeting up with one of my dearest friends. To close off my weekend I went together with my mom to Mercedez-Benz Fashion Week Amsterdam last Sunday. I wen to visit two shows, first Tony Cohen's Fashion Show and later on to Ratna Ho, Artez's new talents. However, back to Cohen's show! The show start at 6 PM where I spotted loads of fashion minded people, bloggers and editors. 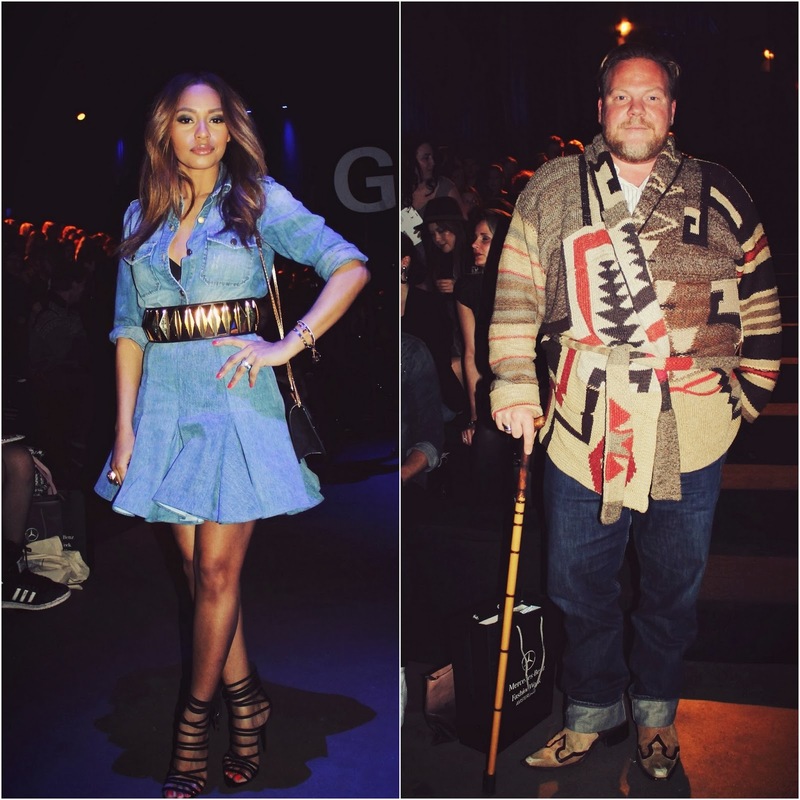 I also snapped stylist Bastiaan van Schaik and fashionista Winonah de Jong just before the show started. Kim Feenstra, a famous dutch model opened the show and loads of beautiful creations by Tony's hand followed. We saw a lot of leather, black and white and soft powder shades. Stay tuned for this noon's Fashion Week blogpost about Ratna Ho's Fashion Show. OUTFIT | Happy New Bag! Hi guys, How have you been! As you see, I can wear normal clothing now! The doctor brought the good news that I do not need the gesso anymore! Whoo whoo! However, I still need to walk with the sticks and I need to wear running shoes at least one week, but I do not mind! So when I was done at the hospital after I got rid off that hideous thing around my leg I went to downtown Amsterdam. I have been saving up some money for some months to buy a new bag. And here it is, my gorgeous 3.1 Philip Lim bag. I love it so much! It is perfect, because due the color combination you can wear it all year long. And it was the last one, pfieuw! What do you think of it? Let me know what youre favorite it bag is of the moment! Hi guys, How was your weekend? I had a great one! Last Friday we went together with all the photo bloggers of FindMyMusthave.nl to have a drink together for the new year. It was a great night, with loads of wine and food. Though, this weekend I had to study, because I have my exams this week. And I am also home taking care off really great. As you see I look a bit different as you notice, because I broke my foot. I fell off my bike in Amsterdam and broke my foot, typical.. ;-) However, what can you wear when your leg is wrapped up in gesso until my knee. Heels are not an option, just like skinny jeans or leather leggings. So I figured out wearing tights together with shorts or dresses like this one. What would you wear when you would be in this situation. Or have you been in this situation before? Let me know! HAPPY FASHIONABLE BIRTHDAY KATE MOSS! Today is the birthday of a true living legend, Kate Moss! Here is a small selection of my favorite shots of this british model. Check out my Pinterest board for more! Hi guys, How have you been? I have great news for you. Together with the brand by Tiara (find their Facebook here) I am hosting a GIVEAWAY! Win this fabulous Bunny Tee! Normally this tee is for boys, however when I bunny is wearing Christian Louboutins, a girl just can't resist! OUTFIT | No Heels No More?! No heels no more?! Gosh, yesterday night I fell with my bike because I had to dodge a car that was driving like crazy. However, I fell that bad that I cannot even stand on one foot and I did not sleep all last night, so my mom figured out that I should visit the hospital. And if there is one thing I hate, it is the hospital. I don't know, but the scent, the people, the whole atmosphere does not feel right.. It might be broken, or bruised, or maybe nothing (let's pray for that one). However, the first thing that came up in my mind as a true fashionista.. NO HEELS NO MORE?! Ok, I will keep you posted about what is going on with that little foot of mine. Enjoy your day! BTW, how cool are the locations where I shot my outfit pictures? Love it! OUTFIT | Ready to Shop! Hi guys, Did you have a good weekend? I'm back in Amsterdam again! Enjoying the busy streets, crazy people on bikes and all other things that make Amsterdam Amsterdam. It is a bit chilly, however the sun is shining to the max. I am not sure yet if I miss the snow, because I can wear heels again (ok, not in these pictures)! And I can shop again, OMG! There is a lot of sale going on. And with sale, I mean SALE! But my eyes are already on a great blue/black piece of 3.1 Philip Lim. However, this bag is from the new collection is stunning. And I saved up some money. I cannot wait to go for some real shopping after spending three weeks in a place where it is fashion to wear mountain shoes and ski pants all day long. So stay tuned guys, because this piece will soon be mine! What is your favorite piece of the new season?